My work is a personal reflection on the chaotic world we live in. It focuses on the relationships between figureheads and the massive population underneath that prop them up or tear them down. The true focus of my work however is the personal journeys people take that others will little note. My work reflects on hopes and dreams, about hurting and being hurt. Living out what I believe to be the true meaning of humanity. 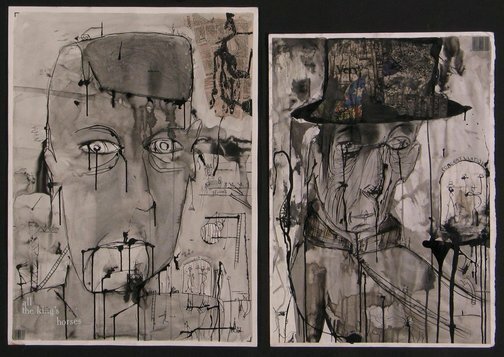 To create my drawings I used water, charcoal, pencil, glue, white paint, newspaper and ink.